3/24/2008Share this story on Facebook! Ithaca College will be hosting the last weekend in March the third annual Finger Lakes Tap Dance Festival. The festival will include classes for adults and children alike and will also include a performance by Tap All-Stars. Performering are well-known tap dancers including Tony Award winner Jimmy Slyde; Dianne "Lady Di" Walker; Michelle Dorrance of Ti Dii dance troupe; Rocky Mendes; co-founder of Tap Legacy Foundation Andrew Nemr, and Baakari Wilder from "Bring in 'Da Noise, Bring in 'Da Funk." Each class will be taught by one of the performers, giving people chance to learn from some of the best tap dancers around! 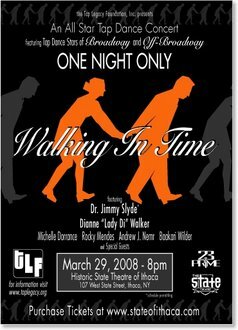 On the 29th, the group will perform together in "Walking in Time," an all-star tap dance concert. In addition to the professional performers, the Ithaca College Tap Dance Club, Ithaca's Armstrong School of Dance, and Rochester's Perinton Dance Company will be joining in the performance.